It’s that dreaded time of year again!. For those of us in the northern part of the country, the snow is falling, cars are stalling, and I start grumbling a bit more than usual. You can buy ready made de-icer but quite often it either doesn’t work well or it costs you an arm and a leg. There are several options to help you with this chore, with some being more practical than others. See what has worked for others, and how you can take control of a frozen windshield and limited visibility for just a few pennies. Optional: Add a tablespoon of salt (sounds crazy, but for stubborn thick ice this works well. Combine the water and the alcohol in your spray bottle. Mix it up a little by sealing the top of your bottle and inverting it a few times. Bam! Your de icer has been made! 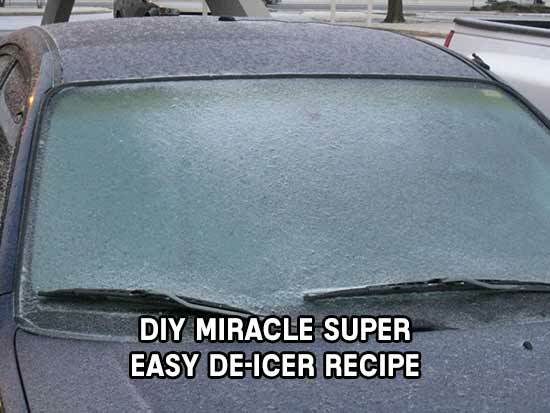 I really hope this awesome recipe helps you keep your windshields as freeze free as mine! I absolutely love this stuff! Have a great winter! Thanks for reading and be sure to share this info with your friends using the social share buttons below. Talking about social stuff, consider liking our Facebook page to keep up to date with our articles. Check out our other articles for more mental scoops!